This month introduces us to the most iconic of red gems: Ruby, the birthstone of July. Trick question – rubies don’t exist! Well, they do, though technically they are no more than red sapphires. Both ruby and sapphire are names given to gem-quality stones of the mineral corundum (Al2O3). Although the word “sapphire” is commonly used to imply blue gems, it can also be used to refer to the whole range of coloured and colourless corundums (from green or yellow to peachy-orange and purple), while “ruby” refers strictly to red or pink stones. Sapphire will be blogged later this year as the birthstone of September. The crystal structure of corundum consists of aluminium atoms surrounded by six oxygen atoms in a slightly irregular “octahedral” shape. Each oxygen atom is shared between four of these octahedra – some of which are joined at the corners, some along edges, and some on the faces – so that the ratio of aluminium to oxygen atoms is 2:3. Pure Al2O3 is colourless; the many colours it displays in nature are caused by trace metal impurities. Rubies are red due to the presence of chromium, while blue sapphires contain tiny amounts of titanium and iron. Rather than occurring as distinct chunks or particles distributed through the crystal, these metals are actually incorporated into the crystal structure on an atomic scale – meaning that a percentage of the aluminium atoms are simply replaced by the impurity element at random points throughout the whole crystal. (A strongly coloured red ruby might have about 1% of its aluminium replaced with chromium.) This kind of atom-for-atom substitution is known as a “solid solution”, because the corundum structure can be thought of as a liquid that “dissolves” an impurity. Of course, dissolving a metal in a gem requires far more energy than dissolving a sugar cube in water! This is why rubies and many other solid solutions are only formed at very high temperatures, such as those found under the earth. Natural ruby has been known and valued for its ornamental uses since ancient times, though many red gemstones were indiscriminately termed “rubies” before scientific tests allowed man to distinguish between true rubies and other red gems. Rubies have historically been mined in parts of south Asia (Afghanistan to Sri Lanka), Africa, Australia, and south-east Asia, especially Myanmar, from which the richly-coloured but gorily-named “pigeon’s blood” rubies originate. (Pigeons evidently have redder blood than the rest of us!) The largest mined ruby in the world, the Liberty Bell Ruby, was stolen in a high-profile heist in 2011 and remains unrecovered. In addition to its aesthetic appeal, ruby finds important technical applications as a laser material, so optical-quality specimens remain in high demand. 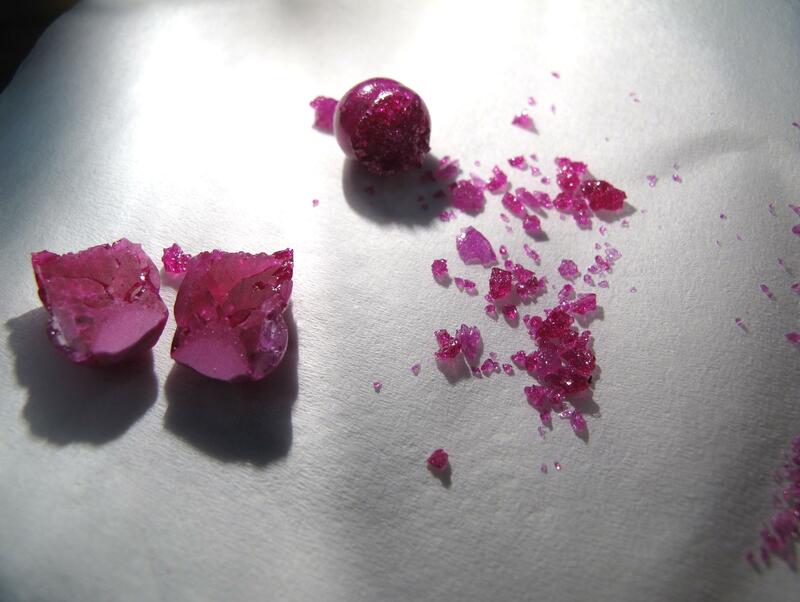 The majority of laser rubies are now grown synthetically, often using the Vernueil flame-fusion technique, though hydrothermal or melt-crystallisation methods (Czochralski, floating-zone growth) can also be employed. William and Lawrence Bragg (the father-and-son team of Nobel Prize and crystallographic Bragg’s Law fame) studied the structure of corundum in 1917. Although they correctly predicted the formula Al2O3 and the six-fold coordination of aluminium, many of their proposed bond lengths were inaccurate. Linus Pauling and Sterling Hendricks published the corrected corundum structure in 1925. SrFeO2 (ICSD-173434) drawn with VESTA; green: Strontium atoms, brown: Iron atoms, red: Oxygen atoms. For years, chemists studying minerals and metal oxides have used “solid-state” reactions to make their compounds, forcing dry powders to react with each other by roasting them in furnaces at temperatures up to 1800 °C. The extreme conditions provide the atoms with enough energy to move about and form new crystal structures, but they also give the chemist limited control over the final product, because the atoms tend to settle into their “favourite” arrangements upon cooling. Now, scientists are exploring new methods for transforming crystals at lower reaction temperatures, where the atoms are unable to move as freely, as a way of creating unnatural and exotic crystal structures. The “infinite layer” oxide SrFeO2, first reported in Nature by Tsujimoto and coworkers in 2007 , contains a very unusual structural feature: iron surrounded by four oxygen atoms in a square arrangement, each square sharing corners with its neighbours. 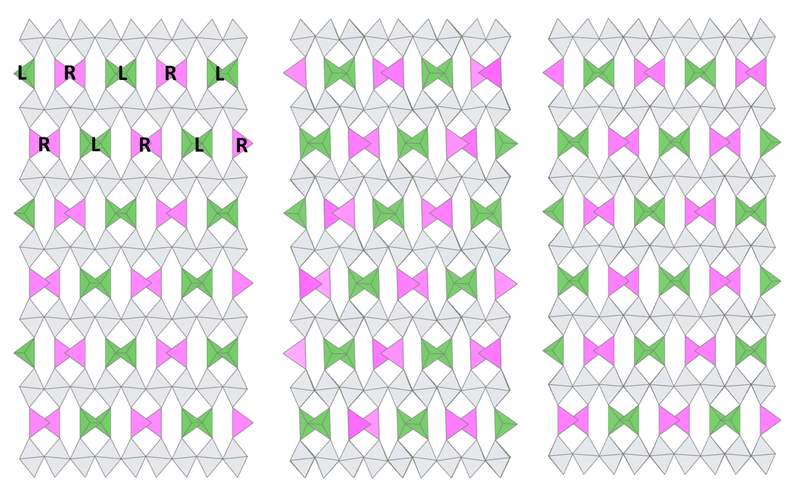 These two-dimensional sheets of FeO2 are held apart by layers of strontium atoms, which sit in the “windows” of the square network. 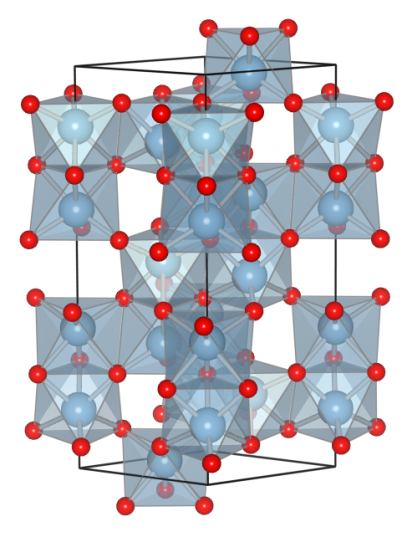 The reason it’s considered a rarity is that iron almost always prefers a three-dimensional tetrahedral geometry when bonded to four oxygen atoms – in fact, the only natural mineral known to contain iron-oxygen squares is gillespite (BaFeSi4O10), whose squares are not networked but isolated from each other by rings of silica. Tsujimoto et al. were able to create their remarkable iron oxide network by heating SrFeO3, a cubic perovskite, to a very modest 280 °C in the presence of calcium hydride (CaH2). 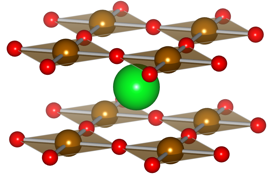 The relatively low reaction temperature allowed the CaH2 to draw some oxygen out of the perovskite structure while the metals stayed in place. Voilà – a brand new ferrite! 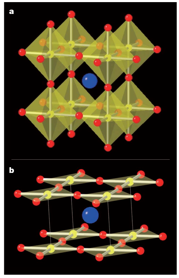 Similar methods have since produced a whole set of closely related structures containing calcium, cobalt and manganese [2,3], which have been studied for their interesting magnetic properties. The moral of the story: sometimes, softly does it. The above information was sourced from Tsujimoto’s Nature article  and the other references below. Images were generated using the structure file deposited in ICSD (Ref. 173434) by C. Tassel et al., J. Am. Chem. Soc. 130 (2008) p.3764-3765. Y. Tsujimoto et al, Nature, 450 (2007) p.1062-1066. C. Tassel et al., J. Am. Chem. Soc., 131 (2009) p.221-229. L. Seinberg et al., Inorg. Chem. 50 (2011) p.3988-3995.